Have you watched "House of Cards": Season 2 yet? I did. And while I have a lot to say about the actual plot, you can go read critiques from actual TV critics somewhere else. Like Twitter. Instead, I&apos;d like to briefly discuss the wardrobe situation. The clothes in the first season of "House of Cards" were good. So good, in fact, that I tracked down costume designer Tom Broecker via LinkedIn and forced him to talk to me for almost an hour about everything from Claire Underwood&apos;s feminine-power dresses to Zoe Barnes&apos; hoodies. (We also went into his work on "30 Rock" and "Saturday Night Live.") Broecker clearly spent a lot of time telling these characters stories through their clothes, and he did an exceptionally good job of it. The results were quietly mesmerizing. 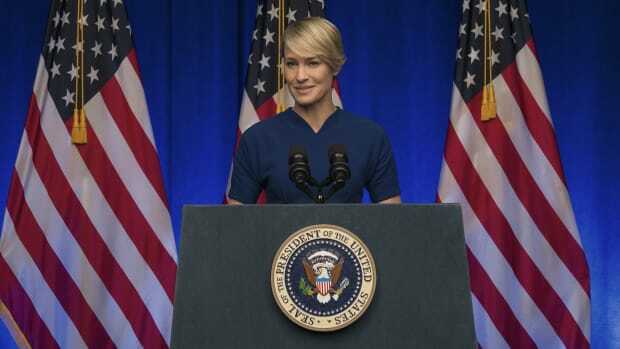 So I was surprised this past weekend to find myself disappointed with the fashions in "House of Cards": Season 2. The suiting is still on point, and Frank Underwood&apos;s blue ties are particularly meaningful. (Since there is no "Spoiler Alert" at the top of this article, I will refrain from explaining why.) And the peripheral characters -- particularly call girl Rachel Posner and a friend she meets at church -- look appropriate. But the wardrobe of Claire Underwood, played by Robin Wright -- which was arguably Broecker&apos;s crowning achievement in the first season -- feels off. Wright is beautiful and has an incredible body, so she is never going to look bad. But the particular choices -- a black, origami collar dress, and several pencil skirt/button-up shirt combinations -- are uninspired. Claire&apos;s first-season closet was exciting because it appeared very deliberate, yet at the same time unexpected for a politician&apos;s wife. For instance, a silvery-gray gown seemed far more avant-garde than anything a real D.C. insider would likely wear to a gala. While the pieces this season were in character, they looked more like something a woman who was copying Claire Underwood&apos;s look would wear than what Claire would actually wear herself. It&apos;s a bit of a mystery as to why Broecker didn&apos;t return for Season 2, given that he was nominated for a Costume Designers Guild Award for his work on the show. (The award ceremony takes place this Saturday, February 22. Broecker is also nominated for in the same category for "Saturday Night Live".) I&apos;ve reached out to Netflix for comment and will update accordingly. Broecker&apos;s replacements -- Gersha Phillips, who is credited on IMDB with three episodes and Johanna Argan, who is credited with one (although I noticed Argan&apos;s name in the intro more times than that, and she has done interviews with the press) -- have not veered away from his original idea. They just haven&apos;t built on it. Growing public interest in the wardrobes of television characters indicates that it would be wise for "House of Cards" to bring Broecker back for Season 3. Because, as anyone who has plowed through Season 2 knows, the stakes will be higher than ever, and Claire&apos;s going to need the clothes to match her new role. Kemal Harris, the character's costume designer, promises us that the nation's most ruthless (fictional) first lady "doesn't hold back." For one night each year at the White House Correspondents' Dinner the worlds of politics, Hollywood, and fashion collide. It's always weird and awesome. Like when Hayden Panettiere met Rahm Emanuel, what did they say to each other? Last night's dinner was perhaps the most fashion-filled to date.